﻿Get your binoculars and spotting scopes out, Tofino - the annual spring shorebird migration is just beginning! With the first salmonberry blossoms come the first flocks of shorebirds darting along our beach and mudflat shorelines. Watching the flashes of colour as a flock of shorebirds dance and dart about in harmony is an incredible sight that you shouldn’t miss. 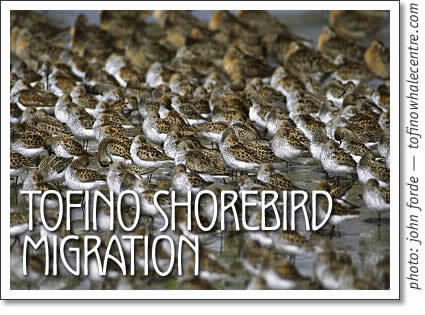 Every year beginning in mid-to-late April to early May, flocks of sandpipers, plovers, whimbrels, and many other shorebirds pass through the Tofino area. The combination of expansive mudflats and long sandy beaches create an ideal habitat for these migratory shorebirds. Thousands of them stop here stop to feed and rest – some for just three days – as they make their impressive journey from South and Central America northward to their Arctic breeding grounds. This annual migration can be up to 7000 km, with 2000 km between stops! One of the most commonly sighted species is the western sandpiper, with peak counts in Tofino of 16,000 in May 1988, 23,000 in August 1989, and an average autumn peak of 35,000 at Chesterman Beach. These peak counts are reported to be amongst the highest recorded on the west coast of Canada for this species. These numbers represent at least 2.25% of the global population during spring and up to 8.2% of the global population during fall. Those percentages might seem small, but they are great enough to make the Tofino Mudflats a globally significant stopover site. So what’s the best way to view the shorebirds? Visit the Tofino Mudflats from now until mid-May using access sites such as the Tofino Botanical Gardens or the end of Sharp Road (turn off the highway at the Dolphin Motel). Time your visit for about two – three hours before high tide, as the incoming water will help ‘push’ the birds up the mud towards your viewing station. You can also see them easily at open beach sites such as Mackenzie, Chesterman and Cox Bay beaches. Don’t forget that these birds are only here for a short time, so it’s critical that they are given plenty of space to feed and rest. If you sit quietly nearby and use binoculars or a spotting scope, you can easily observe the birds without disturbing them. Try not to get too close to flocks of shorebirds, and keep dogs under control, ideally on a leash. A friendly reminder to others with loose dogs during shorebird migration can go far if you’re pleasant and non-confrontational! What’s another great way to learn about shorebirds? Come to the Annual Shorebird Festival! This festival was created to raise awareness and appreciation about the remarkable shorebird migration. The 12th Tofino Shorebird Festival will take place May 1-3, 2009 (one week later than originally posted). With a variety of presentations, slideshows and guided birding opportunities in Tofino and Pacific Rim National Park Reserve, these free events will help you learn more about our feathered friends. Full details will be published in the next issue of Tofino Time. Please contact the Raincoast Education Society for more information, at res@island.net or 250-725-2560. The Raincoast Education Society is a charitable society whose mission it is to help shape an environmentally sound future for the Clayoquot and Barkley Sound region through education and community stewardship. Tofino beaches and the Tofino mudflats in Clayoquot Sound are an important resting stop for shorebirds in their migration north in late April to early May.